Hasbro, who apparently owns the rights to all Star Wars toys, sent me the Ultimate FX Lightsaber to try out. As someone who has loved Star Wars since the first time I saw it in kindergarten, I was happy to try out any replica of a lightsaber. I will have to admit that the Ultimate FX Lightsaber is about as close to a real lightsaber as possible. It may not cut through steel, but it does light from the hilt up, and has all the mesmerizing sound effects. The ignition sound is the same as the one from the movie, and if you wave it, you’ll hear the whirring sound as well. If you strike something with the hard plastic blade, it will make a noise, but only the noise of hitting another lightsaber. It can’t make the authentic “lightsaber cutting” noise, but I’m glad that it can’t cut anything. After all, I must have brushed up against several things with the plastic blade, and that includes my shoulder. Now I understand why lightsabers are only fictional. I had the Darth Vader model with the red blade, but there are others to choose from as well, like Luke’s green blade from Return of the Jedi, Mace Windu’s purple blade, and Anakin’s blue blade. You can even get the Darth Maul version, which can screw together with another to from a double bladed one. This model also works as Asajj Ventress’ saber as well. 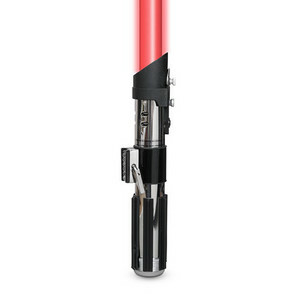 The Star Wars Ultimate FX Lightsaber is available on the Hasbro Toy Shop for about $34.99. Also included with a lightsaber is a DVD of a “Force Tech Training”, which is essentially ten minutes of footage from the Clone Wars series mixed with CG characters doing lightsaber moves. You mentioned a Mace Windu purple lightsaber, however I am having trouble finding it. Any idea if Hasbro is in fact making it. All that seems to be out there is the Anakin (blue) and Darth Vader (red). The Mace Windu, Luke, and Darth Maul sabers are only in the Force FX line ($100+), not the new Ultimate FX ($35) line. Currently the only sabers in the Ultimate FX line are Vader’s red saber and Anakin’s blue saber. The ultimate fx lightsaber styles or models are darth vader,luke skywalker ROTJ, and anakin skywalker. Mace windu is only in the force fx series. The force fx series is higher quality. The hilts are in fact metal, and the blade is longer. the blade is more durable however these are meant to be collectibles so if you want to fight with the lightsaber ultimate fx is for you. Darth Maul [double-bladed], Obi-Wan Kenobi from EP. 1, Qui-Gon Jinn, Yoda, Anakin Skywalker, Darth Vader, and Luke Skywalker from EP. 6.